Bury chairman Stewart Day has confirmed that money from the renaming of Gigg Lane will be made available to strengthen the club's playing staff. The League Two club have with sportswear retailer JD Sports. "The money will be made available to go and recruit better players." Speaking to BBC Radio Manchester, he continued: "Our aim over the next five years is to get into the Championship, and to do that we've got to heavily recruit to the team. The only way I want to get out of this division is by promotion." Gigg Lane will now be known as The JD Stadium, and it is the first time in Bury's 128-year history that the name of their home ground has been changed. Day, who says the sponsorship deal is the biggest in the club's history, is keen to avoid a repeat of the financial ruin that almost saw Bury cease to exist earlier this year, following their relegation to the fourth tier. 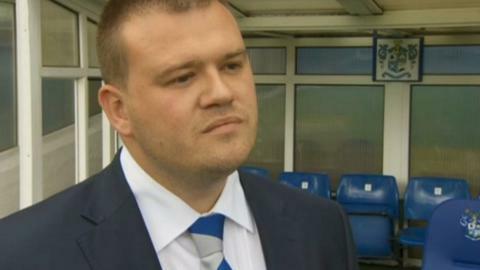 "What it means to Bury is to try and create a financial stability within the football club," he said. "We all know that, six months ago, the club was 12 hours away from going out of business. Part of the remit was to so that it doesn't have those dark days again." But Day accepted that many people will still refer to the stadium by its old name, adding: "A lot of people will always call it Gigg Lane because that's how it's always been known. "We've got a brand here that we're trying to work with. They're a professional company and a local company that have done extremely well."